In February, the US Supreme Court heard arguments in Microsoft’s case arguing that a domestic warrant does not necessarily have the power to compel it to turn over documents stored in overseas data centers. Now that a piece of sweeping surveillance legislation has become law, Microsoft admits that the case is dead. Microsoft’s case stems from a dispute over a 2013 warrant served to the Redmond-based tech giant that demanded emails belonging to a suspect in a drug trafficking case. The emails were stored on a server located in Ireland, and Microsoft essentially said that the US government didn’t have jurisdiction—Ireland agreed. 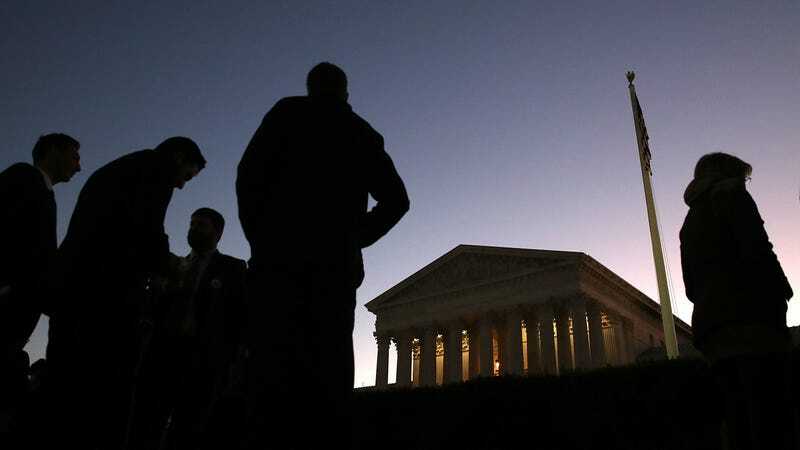 The Supreme Court was expected to make a decision this summer, but the last-minute inclusion of the CLOUD (Clarifying Lawful Overseas Use of Data) Act in the recent omnibus spending bill made the case moot. On Tuesday, the Department of Justice asked the Supreme Court to drop the case and Microsoft’s lawyers quickly chimed in to say they supported the case’s dismissal. “Microsoft agrees with the government that there is no longer a live case or controversy between the parties with respect to the question presented,” legal representatives for the company wrote in a filing with the court. In a blog post on Wednesday, Microsoft President Brad Stone acknowledged that it was a bit of a shock to see the CLOUD Act pass in such a quick and uncontested fashion. He also detailed Microsoft’s hesitant support for the bill, saying that the company has always felt that Congress should write “new legislation and new international agreements to reform the process by which law enforcement officials around the world gather digital evidence and investigate crimes.” Microsoft has maintained that current laws were outdated and that the Supreme Court shouldn’t be the one to set new precedents on outmoded rules. Stone said that there was still plenty of work to be done by the courts and legislators going forward. While Microsoft’s support for new legislation regulating the exchange of data across borders for law enforcement is reasonable, the CLOUD Act appears to be an ill-considered solution. The way it works is complex but critics argue that it hands too much power to the office of the president, creates a “backdoor” around the Fourth Amendment, and opens up citizens around the world to privacy violations. It might have appaered that Microsoft was standing up for its users’ legal rights in court, but it seems now that more than anything it was looking for a legal way out of being involved in the argument at all.